Much of what is termed communication in organisations is but a one-way, non-interactive process of information transfer. It doesn’t seem right to call this communication, and other terms such as propaganda carry too much baggage. In view of this, I’ve been searching for an appropriate term for some time. Now – after reading a paper by Terence Moran entitled Propaganda as Pseudocommunication – I think I have found one. Moran’s paper discusses how propaganda, particularly in the social and political sphere, is packaged and sold as genuine communication even though it isn’t – and hence the term pseudo-communication. In this post,I draw on the paper to show how one can distinguish between communication and pseudo-communication in organisational life. As Watergate should have taught us, the determined and deliberate mass deceptions that are promulgated via the mass media by powerful political figures cannot be detected, much less combated easily. Such propaganda is not the preserve of politicians alone, though. The wonderful world of advertising illustrates how pseudo-communication works in insidious ways that are not immediately apparent. For example, many car or liquor advertisements attempt to associate the advertised brand with sophistication and style, suggesting that somehow those who consume the product will be transformed into sophisticates. Indeed! And I would add that the problem has only become worse in the 30 odd years since Mr. Moran wrote those words. More relevant to those of us who work in organisation-land, however, is the fact that sophisticated pseudo-communication has wormed its way into the corporate world, a prime example being mission/vision statements that seem to be de rigueur for corporations. Such pseudo-communications are rife with platitudes, a point that Paul Culmsee and I explore at length in Chapter 1 of our book. Due to the increasing sophistication of pseudo-communication it can sometimes be hard to distinguish it from the genuine stuff. Moran offers some tips that can help us do this. Moran describes several characteristics of pseudo-communication vis-à-vis its authentic cousin. I describe some of these below with particular reference to pseudo-communication in organisations. In organisational pseudo-communication the receiver is not free to interpret the message as per his or her own understanding. Instead, the sender determines the meaning of the message and receivers are expected to “interpret” the message as the sender requires them to. An excellent example of this are corporate mission/vision statements – employees are required to understand these as per the officially endorsed interpretation. Summarising: in communication control is shared between the sender and receiver whereas in pseudo-communication, control rests solely with the sender. To put it quite bluntly, the aim of most employee-directed corporate pseudo communication is to get employees to behave in ways that the organisation would like them to. Thus, although pseudo-communiques may use words like autonomy and empowerment they are directed towards achieving organisational objectives, not those of employees. Summarising: in communication the stated and actual goals are the same whereas in pseudo-communication they are different. Specifically, in pseudo-communication actual purposes are hidden and are often contradictory to the stated ones. Following from the above it seems pretty clear that the success of organisational pseudo-communication hinges on employees not analysing messages in an individualistic or critical way. If they did, they would see it for them for the propaganda that they actually are. In fact, it isn’t a stretch to say that most organisational pseudo-communication is generally are aimed at encouraging groupthink at the level of the entire organisation. A corollary of this is that in communication it is assumed that the receiver will act on the message in ways that he or she deems appropriate whereas in pseudo-communication the receiver is encouraged to act in “organisationally acceptable” ways. Summarising: in communication it is expected that receivers will analyse the message individually in a critical way so as to reach their own conclusions. In pseudo-communication however, receivers are expected to think about the message in a standard, politically acceptable way. Since pseudo-communication works best by dulling the critical faculties of recipients, it seems clear that it should aim evoke a emotional response rather than a rational (or carefully considered) one. Genuine communication, on the other hand, makes clear the relationship between elements of the message and supporting evidence so that receivers can evaluate it for themselves and reach their own conclusions. Summarising: communication makes an appeal to the receivers’ critical/rational side whereas pseudo-communication aims to make an emotional connection with receivers. In organisational pseudo-communication such as mission/vision statements and the strategies that arise from it, the ends are seen as justifying the means. The means are generally assumed to be value-free in that it is OK to do whatever it takes to achieve organisational goals, regardless of the ethical or moral implications. In contrast, in (genuine) communication, means and ends are intimately entwined and are open to evaluation on rational and moral/ethical bases. Summarising: in pseudo-communication, the ends are seen as justiying the means whereas in communication they are not. In organisational pseudo-communication the the organisation’s world is seen as being inherently simple, so much so that it can be captured using catchy slogans such as “Delivering value” or “Connecting people” or whatever. Communication, on the other hand, acknowledges the existence of intractable problems and alternate worldviews and thus viewing the world as being inherently complex. As Moran puts it, “the pseudo-communicator is always endeavouring to have us accept a simplified view of life.” Most corporate mission and vision statements will attest to the truth of this. Summarising: pseudo communication over-simplifies or ignore difficult or inconvenient issues whereas communication acknowledges them. Although Moran wrote his paper over 30 years ago, his message is now more relevant and urgent than ever. Not only is pseudo-communication prevalent in politics and advertising, it has also permeated organisations and even our social relationships. In view of this, it is ever more important that we are able to distinguish pseudo-communication from the genuine stuff. Incidentally, I highly recommend that reading the original paper -it is very readable and even laugh-out-loud funny in parts. Finally, to indulge in some speculation: I wonder why pseudo-communication is so effective in the organisational world when even a cursory analysis exposes its manipulative nature. I think an answer lies in the fact that modern organisations use powerful, non-obtrusive techniques such as organisational culture initiatives to convince their people of the inherent worth of the organisation and their roles in it. Once this is done, it makes employees less critical and hence more receptive to pseudo-communication. Anyway, that is fodder for another post. For now, I leave you to ponder the points made above and perhaps use them in analysing (pseudo)communication in your own organisation. Management consultants and gurus emphasise the need for organisations to adapt to an ever-changing environment. Although this advice is generally sound, change initiatives continue to falter, stumble and even fail outright. There are many reasons for this. One is that the unintended consequences of change may overshadow its anticipated benefits, a point that gurus/consultants are careful to hide when selling their trademarked change formulas. Another is that a proposed change may be ill-conceived (though it must be admitted that this often becomes clear only after a change has been implemented). That said, many changes initiatives that are well thought through still end up failing. In this post I discuss one of the main reasons why this happens and what one can do to address it. Let’s begin with a two dimensional grid as in Figure 1, with time on the horizontal axis and the state of the organisation along vertical axis (before going any further I should also mention that this model is grossly simplified – among other things it assumes that the state of the organisation can be defined by a single variable). We can represent the current state of a hypothetical organisation by the point marked as the “Initial state” in Figure 1. Figure 1: Initial and final states of change. Now imagine that the powers that be have decided that the organisation needs to change. Further, let’s imagine (…and this is hard) that they have good advisors who know what the organisation should look like after the change. 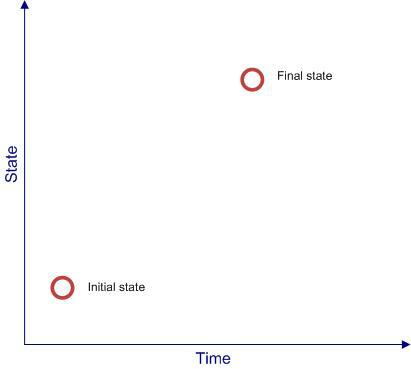 This tells us the position of the final state along the vertical axis. 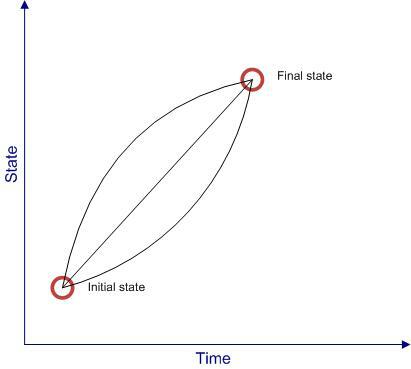 To plot the final state of the organisation on our grid we also need to fix its position along the horizontal (time) dimension- that is, we need to know by when the change will be implemented. The powers that be are so delighted by the consultants’ advice that they want the changes to be rolled out asap (sound familiar?). Plucking a deadline out of thin air, they decree it must be done by within a certain fixed (short!) period of time. The end state of the organisation is thus represented by the point marked as the final state in Figure 1. Let’s now consider some of the paths that by which the organisation can get from initial to the final state. Figure 2 shows some possible change paths – a concave curve (top), a straight line (middle) and a convex curve (bottom). 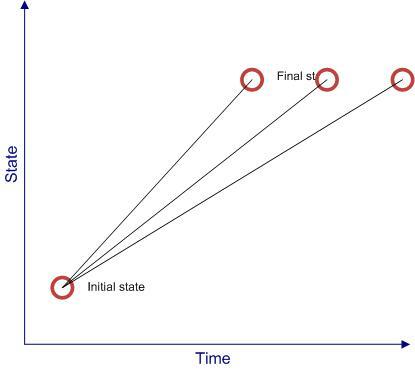 Insofar as this discussion is concerned, the important difference between these three curves is that each them describes a different “rate of change of change.” This is a rather clumsy and confusing term because the word change is used in two different senses. To simplify matters and avoid confusion, I will henceforth refer to it as the velocity of organisational change or simply, the velocity of change. The important point to note is that the velocity of change at any point along a change path is given by the steepness of the curve at that point. To keep things simple I’ll assume that the change in our fictitious organisation happens at a constant velocity – i.e it can be described by the straight line. This is an oversimplification, of course, but not one that materially affects the conclusion. What is clear is that by mandating the end date, the powers be have committed the organisation to a particular velocity of change. The key question is whether the required velocity is achievable and, more important, sustainable over the entire period in which the change is to be implemented. Figuring out an achievable and sustainable velocity of change is no easy matter. It requires a deep understanding of how the organisation works at a detailed level. This knowledge is held by key people who work at the coalface of the organisation, and it is only by identifying and talking to them that management can get a good understanding of how long their proposed changes may take to implement and thus the actual path (i.e. curve) from the initial to the final state. Problem is, this is rarely done. First, the obvious one – a slower pace means that it is less likely that people will be overwhelmed by the work involved in making the change happen. The organisation can make changes incrementally, observe its effects and decide on next steps based on actual observations rather than wishful thinking. The organisation has enough time to absorb and digest the changes before the next instalment comes through. Implementing changes too fast will only result in organisational indigestion. Problem is, the only way to do this is to allow a longer time for the change to be implemented (see Figure 3). The longer the time allotted, the lower the velocity of change (or steepness) and the more likely it is that the velocity will be achievable and sustainable. Of course, there is nothing radical or new about this, It is intuitively obvious that the more time one allows for a change to be implemented, the more likely it is to be successful. Proponents of iterative and incremental change have been saying this for years – Barbara Czarniawska’s wonderful book, A Theory of Organizing, for example. Many well-intentioned organisational change initiatives fail because they are implemented in too short a time. When changes are implemented are too fast, there is no time to reflect on what’s happening and/or fix problems. The way to avoid this is clear: slow down. As in a real journey, this will give you time to appreciate the scenery and, more important, you’ll be better placed to deal with unforeseen events and hazards. Business schools perpetuate the myth that the outcomes of changes in organizations can be managed using models that are rooted in the scientific-rational mode of enquiry. In essence, such models assume that all important variables that affect an outcome (i.e. causes) are known and that the relationship between these variables and the outcomes (i.e. effects) can be represented accurately by simple models. This is the nature of explanation in the hard sciences such as physics and is pretty much the official line adopted by mainstream management research and teaching – a point I have explored at length in an earlier post. Now it is far from obvious that a mode of explanation that works for physics will also work for management. In fact, there is enough empirical evidence that most cause-effect based management models do not work in the real world. Many front-line employees and middle managers need no proof because they have likely lived through failures of such models in their organisations- for example, when the unintended consequences of organisational change swamp its intended (or predicted) effects. In this post I look at the missing element in management models – human intentions – drawing on this paper by Sumantra Ghoshal which explores three different modes of explanation that were elaborated by Jon Elster in this book. My aim in doing this is to highlight the key reason why so many management initiatives fail. According to Elster, the nature of what we can reasonably expect from an explanation differs in the natural and social sciences. Furthermore, within the natural sciences, what constitutes an explanation differs in the physical and biological sciences. Let’s begin with the difference between physics and biology first. The dominant mode of explanation in physics (and other sciences that deal with inanimate matter) is causal – i.e. it deals with causes and effects as I have described in the introduction. For example, the phenomenon of gravity is explained as being caused by the presence of matter, the precise relationship being expressed via Newton’s Law of Gravitation (or even more accurately, via Einstein’s General Theory of Relativity). Gravity is “explained” by these models because they tell us that it is caused by the presence of matter. More important, if we know the specific configuration of matter in a particular problem, we can accurately predict the effects of gravity – our success in sending unmanned spacecraft to Saturn or Mars depends rather crucially on this. In biology, the nature of explanation is somewhat different. When studying living creatures we don’t look for causes and effects. Instead we look for explanations based on function. For example, zoologists do not need to ask how amphibians came to have webbed feet; it is enough for them to know that webbed feet are an adaptation that affords amphibians a survival advantage. They need look no further than this explanation because it is consistent with the Theory of Evolution – that changes in organisms occur by chance, and those that survive do so because they offer the organism a survival advantage. There is no need to look for a deeper explanation in terms of cause and effect. In social sciences the situation is very different indeed. The basic unit of explanation in the social sciences is the individual. But an individual is different from an inanimate object or even a non-human organism that reacts to specific stimuli in predictable ways. The key difference is that human actions are guided by intentions, and any explanation of social phenomena ought to start from these intentions. For completeness I should mention that functional and causal explanations are sometimes possible within the social sciences and management. Typically functional explanations are possible in tightly controlled environments. For example, the behaviour and actions of people working within large bureaucracies or assembly lines can be understood on the basis of function. Causal explanations are even rarer, because they are possible only when focusing on the collective behaviour of large, diverse populations in which the effects of individual intentions are swamped by group diversity. In such special cases, people can indeed be treated as molecules or atoms. There a couple of interesting implications of restoring intentionality to its rightful place in management studies. Present day management studies exclude considerations of morals and ethics, except, possibly, as a separate course that has little relation to the other subjects that form a part of the typical business school curriculum. Recognising the role of intentionality restores ethical and moral considerations where they belong – on the centre-stage of management theory and practice. Secondly, recognizing the role of intentions in determining peoples’ actions helps us see that organizational changes that “start from where people are” have a much better chance of succeeding than those that are initiated top-down with little or no consultation with rank and file employees. Unfortunately the large majority of organizational change initiatives still start from the wrong place – the top. Most management practices that are taught in business schools and practiced by the countless graduates of these programs are rooted in the belief that certain actions (causes) will lead to specific, desired outcomes (effects). In this article I have discussed how explanations based on cause-effect models, though good for understanding the behaviour of molecules and possibly even mice, are misleading in the world of humans. To achieve sustainable and enduring outcomes in organisation one has to start from where people are, and to do that one has to begin by taking their opinions and aspirations seriously.